As a collector, I'm a bit of a sucker for signing events and with London only an hour away by train I thought I'd pop in to Leicester Square today to see how this latest one played out. 70840 Welcome to Apocalypseburg! 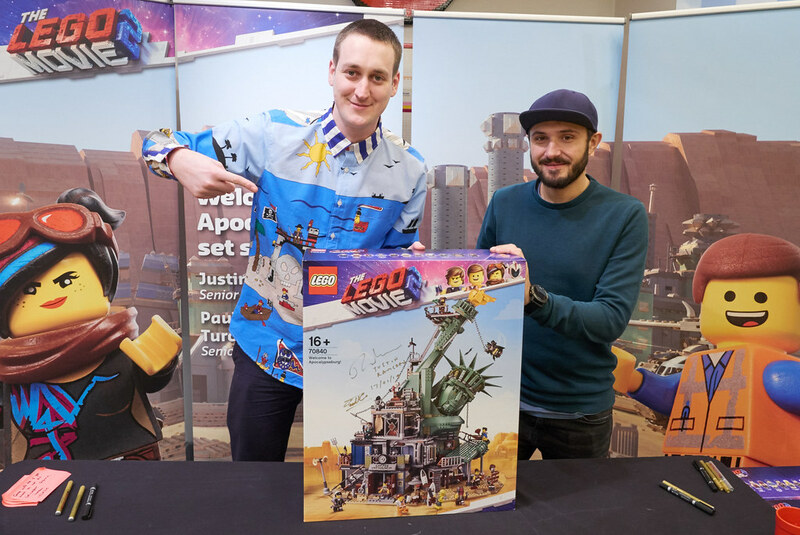 was released yesterday and a whirlwind tour of 3 Brand Stores, Paris, London and Orlando, has given LEGO fans a chance to meet Designer Justin Ramsden and Graphic Designer Paul Constantin Turcanu, shake their hands and have their sets signed. Given how busy other events have been I decided to get there for 10am opening and do a bit of shopping while I sized up the queue. It was a really cold start to the day and I didn't fancy waiting outside – but I needn't have worried. Click through to find out why. I didn't actually intend buying the set today as I had other places to go and I knew it would mean lugging it around all day with me. 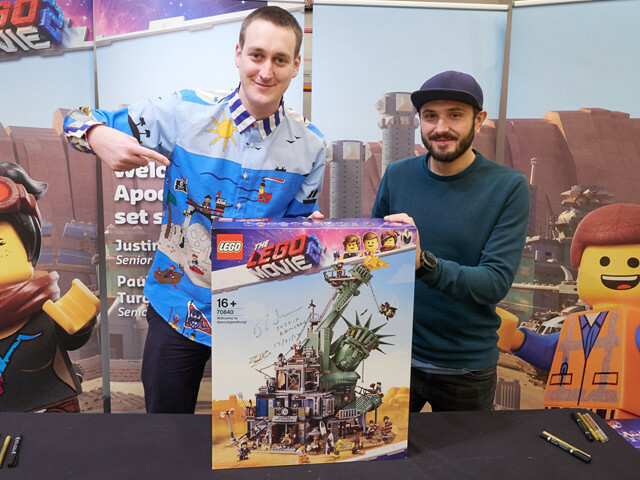 I fully expected to grab a few snaps for Brickset, get into the vibe, and have a couple of much smaller items that I'd brought from home signed by Justin. However for a few reasons, that wouldn't happen and I ended up buying it anyway. One of the reasons was that there was hardly anyone in the shop and nobody waiting for the signing at all. Queuing inside the shop was also possible which was a big bonus given the cold morning outside. All I had to do was pay for the set and wait in line with my receipt – then a new box would be put on the table for signing when my turn came. This meant that you couldn't pick your own box from the (albeit) small pile, but a polite word with the manager left me reassured my copy would be a good one. I had a quick nose around and decided to wait in line. At 10:40 there were only 6 people waiting so I sensed this wasn't going to be the madness that has accompanied some previous events. In fact it was all rather civil – pleasant in fact. I wish they were all like this! When 12:00 came, there was no queue outside and only about 20 people inside. I was all done, dusted and back home in Kent by 1:30. I'd read a few disappointed posts on Facebook that children would be at school and therefore couldn't attend the signing, but I wonder how many kids would actually know who Justin and Paul are anyway? Staging on a Saturday is usually an invitation for chaos no matter what, and as the set hit the shelves yesterday the signing tour dates make sense. To gauge against the two previous signings probably wouldn't be fair either as Tron/Brick Bros and James Bond both have pretty big followings. Those sets were a lot cheaper (and easier to carry) too, but it was still a little surprising that today was going to be an easy outing for me. At 12 on the dot the signings commenced. Justin is well known for his fabulous shirts and today was no exception sporting a colourful Skull Island design. Justin and Paul were both really enthusiastic and I sensed very enjoyable for them to be doing the tour, full of smiles, chat and posing for the camera. I can't say how the queues faired into the afternoon as I was long gone, but with lunch hour being around 12-2 for most I suspect there was a flow of people in an out. If you were there later in the afternoon I'd love to know in the comments how busy it was. I'm glad I went. No silly queues, people were in the warm, there was plenty of room to move – but yet again I have bought something home which I now cannot open. Damn and blast. I'm like you. I need a mint condition box. especially when paying for an expensive set. Justin Ramsden, you're my hero for designing this masterpiece of a LEGO set! Totally awesome!! THANK YOU! 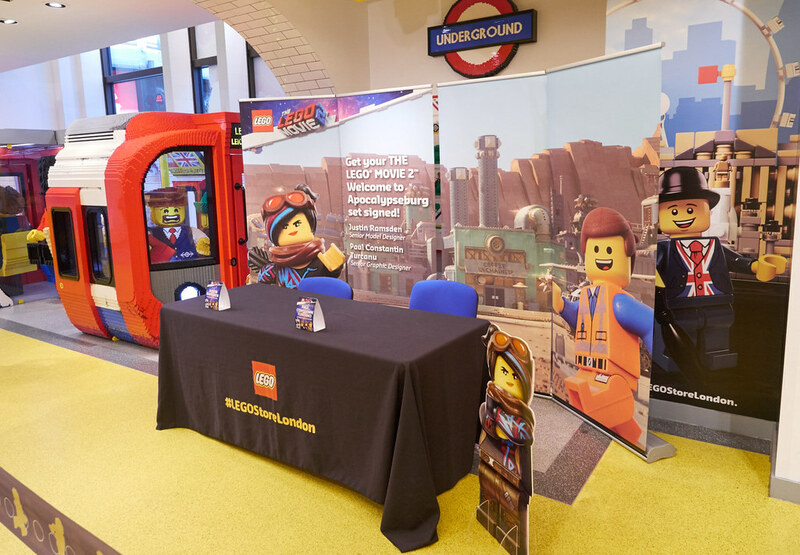 While it's nice that you could avoid crowds, hopefully Lego and Lego Brand Retail took the attendance numbers into account and perhaps will consider different times for future signing events. Aw you box lovers. Open it and enjoy the build and the beautiful model at the end! Just kidding, to each their own, I just can’t imagine buying an expensive set and then be afraid to ever open it. I hope it is similar to this in Orlando. I am doing probably the most stupid thing I have done in a long time. I am flying to Orlando from Denver leaving at 1a.m. getting into Orlando at 7. Get some breakfast rent a car go over to the Lego store wait around for signing. Get some late lunch and back to the airport and fly back home. Totally an impulse thought not to mention a sub $100.00 airfare. Call me crazy. So.. now what do you do with it? Thanks for sharing the experience. I can't imagine the anxiety walking through London and trying to keep the box from getting bumped/scraped on the way home. LOL, the three countries that everyone is talking about: Brexit, les gilets jaunes and the wall with the partial federal shutdown . Only missing China! Too bad, would be curious to know who and how they chose these three and only these three!? I do think the lack of attendance is somewhat due to the lack of interest in this set too, especially for the price. Dropped in the store around 14:30 this afternoon and the designers were chatting with one person, no queues and no one interested apparently. I'll be honest I didn't even know this was on today and have no intention of spending that kind of money on a set regardless of how much I like it. Also based in Kent! 6 people? Wow. Talk about poor advertising. Sure-- please send us photos of the front and back of the packaging. At least your store was kind enough to exchange. When I bought my HP Castle set awhile back the manager just shrugged it off and blamed it on "that's how they're sometimes shipped". This wasn't a simple scuff mind you this was an obvious bottom of the pile heavy smash. Whether you open the box or not, a premium product still deserves to be sold presentably. I saw there were other various expensive sets on the shelf that had obvious smashes or gouges that were still being displayed. Why should LEGO take the time to perfect a building product to fall short in packaging. In case you're wondering as well, surveys and feedback complaints apparently fall on deaf ears at my store. I, too, live only an hour away from the signing event in the US! Wait, does anyone know the number to schedule a Concorde for curbside pickup? Is Orlando really considered the flagship US store? I thought the Mall of America store dwarfed all the other US locations, and I would have figured somewhere New Yorkish would be counted as the flagship based simply on location. If I did get the signed set I would build it by the way. And keep the opened box. Generally I build 99% of the boxed sets I buy and recycle 80-90% of the boxes. It’s a very good way to avoid boxy clutter. This is one of the many things I don’t get. I throw all the boxes into the bin. I have no need of them once they are open. If I was going to get them to sign something I’d Maybe open the box there and pull out the instruction manual for them to sign. That said, this is a fantastic review of an event and really makes me miss not being able to pop on Leicester Square store whenever I like. @ MrKettle - if you intend to keep your LEGo sets forever, NEVER EVER passing them either down the line in a family tree.. or due to some unexpected circumstances (such as moving, short of cash etc..) never ever plan to sell them on a market.. THEN I get your point.. otherwise I find it totally ridiculous.. the box can be easily flattened consuming virtually none space whatsoever.. or do you also fancy buying 2nd hand books without the sleeve covers.. or purchasing as a gfit anything 2nd hand without its previous packaging (e.g. car radio, blu-ray player) and feeling good about it? Of course you can just rip into it and make the thing! Really interesting that there were no crowds. Might tell something about the excitement people have for the movie and/or overpriced sets - not. And why not open it? With those kinds of sets the boxes tend to be without pushtab-flaps, so opening without destroying the box should be easy. Or do you normally rip open the boxes straight through the front? I once had the season two DVD box of Star Trek TOS (the blue one) signed by Leonard Nimoy. Didn't keep me from using the set frequently. Only thing I make sure is to avoid rubbing off the signature - which doesn't really take that much of an effort. So yes, it is easy to have something special and still enjoy the contents I suppose. And about the location in the US. I was wondering that too. Since when is Orlando anything remotely "flagshippy"? New York, sure. San Francisco, obviously. Los Angeles, hell yeah. Even Las Vegas has a nice ring to it, but Orlando? If I ever went to the US again, Orlando would be one of the last places I would think of going. It's like if TLG placed its German flagship store in Kehl. Ever heard of that? See. I guess a lot more things are different in the US than I thought. There's nothing even remotely "flagshippy" about San Francisco. New York, Los Angeles, Chicago. Those are the three biggest cities spread across an area that's roughly the same size as Western Europe (WWII definition, not UN). Orlando is a bigger destination city by far than SanFran just on the fact that Disney parks occupy a huge chunk of Florida around Orlando, and travel to that area is both cheaper and within the same time zone for Eastern US. I'm way up in Michigan, and growing up I was the only person I knew (besides my immediate family) that ever once travelled to California (which was only so my parents could show my brother where he was born), but probably 10% of the kids in my grade had been to Florida by the time I started high school. And for a LEGO Store, being located smack in the middle of Disney Central is likely much more desirable than fighting for the most overpriced real estate in the nation. Yours for only double the retail price. Gateshead Metrocentre staff will always check for a mint box if the ones on display have shelf wear - they are very helpful. I love a perfect box - especially if its for a present - unless there is a hefty discount , and then I don’t care. That said, I think my days of day one purchase are behind me - I’m far more likely to wait for a deal. 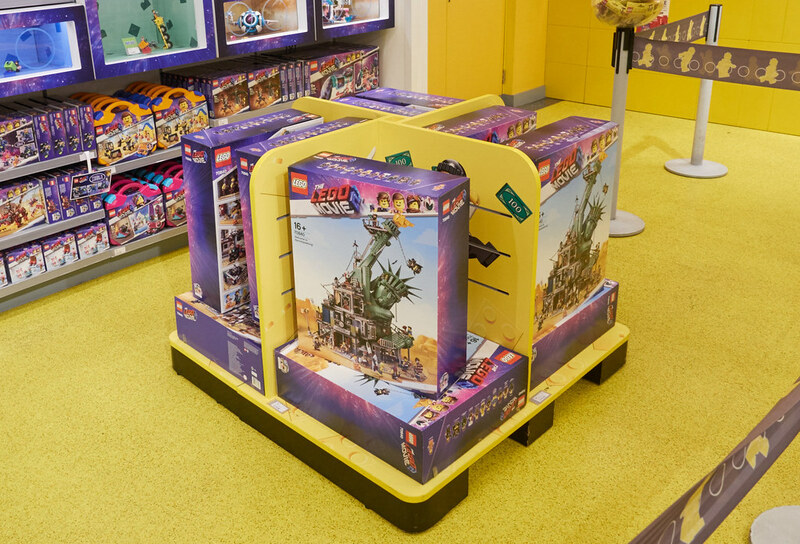 I still cringe when I look at Ninjago city at Smyths and remember how much I could have saved vs the GWP I got! Yep, waiting for a discount on this set, or at least a GWP and double VIP points. Plus it’s January... most people are skint at this time of year, counting down the days to payday. Who wants a signed box anyway, that would just mess up the cover! Signed sets going for double on eBay... who in their right mind would pay that?! I have never really considered flattening my stored Lego set boxes to save on space, but it’s worth considering, I guess. Don’t think I could throw them though. Could be one for a survey on Brickset... to throw or not to throw! @meesajarjar72: I just recently started flattening all our boxes in order to save space when relocating them to the attic. I used to keep them in the cellar fully folded out, but it just takes way to much precious space. I won't throw them away of course, but at least for the time being they shouldn't take up as much room anymore. @Purple Dave: thanks for the heads-up. Coming from a European perspective, unless one has kids one would never think about Orlando as anything major in the US. I would wager to guess if you asked people over here to name important American cities they knew, other than the ones I already mentioned, people would probably name places they know from film and TV, like Dallas, Denver, Philadelphia, and of course Miami. Even though it might be THE go-to destination for families in the US, Orlando/Disneyworld isn't as big a draw for people from across the pond. See the struggles Disneyland Paris has had to face over the years, not being profitable for most of the years it has been open. Not that it isn't a major tourist attraction of course. I can totally understand opening it there and then, pulling out the manual and getting that signed instead. That way, you get to open the set, build it (from the online instructions) and have a signed manual. And guess what - it is rarer than the signed sealed box as everyone gets the box signed, but not the manual. ^Unfortunately, that was not allowed. Still intrigued: what does one do with the signed, unopened box? I do think Orlando is the flagship store for the US for one reason...volume. I've been to both in the DC area and Time Square and the store at Disney Springs always has somewhere in the order of quadruple the number of people in it. And that volume is constant. It's never not packed to the point of discomfort. My nearest Lego store is over an hour away at Potomac Mills, but that could easily be a 3 hour drive with beltway traffic so I never go there. But I am in Orlando constantly for conferences and never don't go to Disney Springs to visit the store despite hating to be there because of the crowds. There is a Legoland 90 minutes or so away and I would say more people go through that Disney Springs store than all of Legoland on a daily basis. I must admit to finding the whole concept of buying Lego then keeping it unopened completely baffling. I have about a dozen convention exclusive sets that are sealed but they are very small, few hundred pieces in each at the most and more of a 'special packaging' thing than anything else but I couldn't keep a set with a few thousand pieces sealed up - it's gotta be built. I've been aware that Disney Paris has been on shaky ground since before it opened. Reports here said that the French (and especially Parisians) absolutely detested the idea of having a Disney park in their backyard. In contrast, they could probably let Disney Tokyo fall into shambles and people would still flock to buy tickets. They _love_ all things Disney in Japan in a way that makes us seem downright apathetic. As for "go-to" destinations, remember that the US is roughly the size of Western Europe by the WWII definition (and factoring in Alaska and Hawaii, spread out over a larger part of the western hemisphere). It's like a seven hour flight to get from one coast to the other, or about a week by car. The geography ranges from arctic to tropical, from desert to swamp, and from snowcapped mountains to plains that are so flat you can't see any variation between you and the horizon in any direction. We have more land set aside for our National Park Service than the UK has land, and two of our national parks are each bigger than Belgium. "Go-to" means very different things to different people, especially depending on how far they can afford to travel, or how long they can afford to take. As for Orlando, yeah, the city itself isn't that big a draw. It's smack in the middle of the sauna known as Florida, it's not particularly big, and the only thing that springs to mind when most people think of Orlando is Disney parks. But Orlando is barely over 100 square miles of land, and after the nightmare they had when trying to establish Disneyland in California (one square mile that's penned in on all sides by cheap motels), Disney managed to buy up 48 square miles near Orlando, of which half is still undeveloped (and 9 were sold). And it's the most visited vacation resort in the world, boasting 52 million annual visitors. They've actually jacked up the prices several times in the last couple years just to keep the crowds manageable. Value is based on supply and demand. If nobody gets the manual signed, it's possibly because there's little desire to own one. But there's already a market for sealed sets, so _signed_ sealed sets is like the difference between owning a "homerun" baseball, and one that has been signed by the hitter who put it over the fence. But given the choice between a baseball and a program, people will generally ask to have a ball signed, and collectors will therefore be willing to pay more for them even though they probably outnumber signed programs on the open market. Interview with Justin Ramsden and Paul Constantin Turcanu, designers of 70840 Welcome to Apocalypseburg!